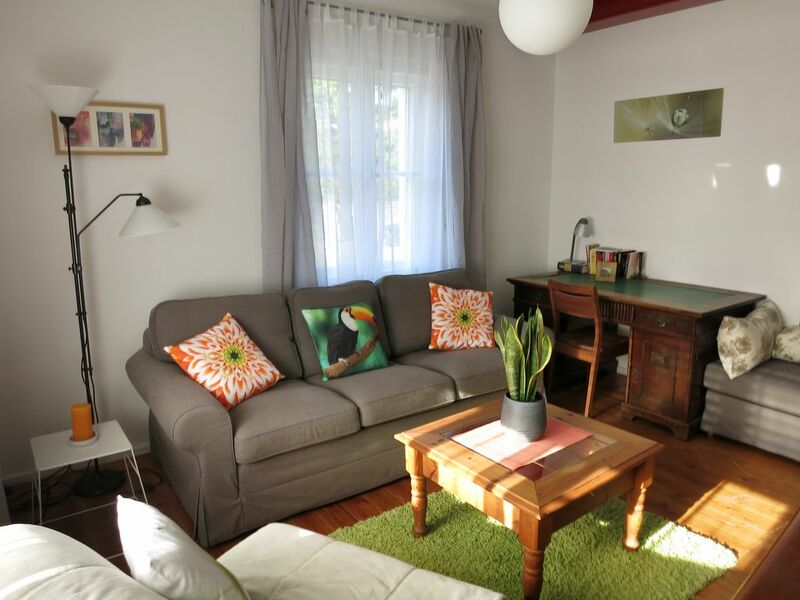 You are looking for a cosy apartment (41m²) for 1-4 persons? We offer you a bright and friendly flat with modern equipment and exclusive details. It was totally renovated on an eco-basis in 2009. The flat is situated in the first floor and has a little corridor. The livingroom has a kitchenette, dinning area and a studio couch for 2 persons. The large bedroom is equipped with a twin bed and a home trainer. The comfortable bathroom has a big bath tub, shower, toilet and washing bassin. The apartment is completely equipped with all necessary like dish washer, towels, dishes, Hi-FI, TV for a pleasant stay. Nearby are shops and restaurants. The sights and the old town as well as the fair ground can be reached within 10 minutes. You are looking for cosy apartments (41m², 55m²) for 1-5 persons? For a relaxing holiday or for business purposes like fairs? We offer you a bright and friendly flats with modern equipment and exclusive details like wooden windows and an oiled wooden floor quiet situated in the city center of Nürnberg. Surrounded by greenery, very central, but at the same time very relaxing with parcs and a lake near-by. The appartments were totally renovated on an eco-basis in 2009 and they are completely equipped with all necessary like dish washer, towels, dishes, Hi-FI, TV for a pleasant stay. Nearby are shops and restaurants for daily needs. The sights and the old town as well as the fair ground can be reached within 15 minutes by foot. A public swimming pool, a restaurant, snackbar, a playground and parkings are nearby. This apartment was located in a beautiful area. The apartment itself had all the requirements needed including kitchen utensils, toilet rolls and towels. The reason for our stay was to exhibit at the Spielwarenmesse Toy fair this was only 10 minutes away by taxi. There is a Lidl and Netto supermarket in walking distance which was very convenient for groceries and essentials. The owners are very friendly and helpful, would highly recommend. Many Thanks! We are looking forward to see you soon - e.g. to next years toy fair. Our stay in Nuremberg was great, the apartment couldn't have been better, other than squeaky floors everything was fantastic. Quiet, warm, and only about a 1.5 miles from downtown. Udo was extremely friendly, if I ever get back to Nuremberg I would stay here again. But I would rent a car, 10 euros a trip for a taxi adds up pretty quick and you're at the mercy of finding one first. We had four adults in apartment one. It was a bit of a squeeze, but worked out well. Everyone had their own comfortable bed which was our primary concern. The kitchen area has a day bed and a comfortable futon - it also has a thick door that we closed at night to separate ourselves into 2 rooms of 2 adults. The kitchen was perfectly adequate to cook meals (stove, microwave, oven, dishwasher) and there were plenty of dishes for all of us. The area is lovely and quiet. And I adored the rolladen-type shutters which makes the rooms completely dark for easy sleeping. The towel warmer is a nice touch for heating/drying towels as well. The bathtub was huge! Bit of a step/climb to get in and out but this was not an issue for us. Hairdryer provided. Lidl grocery was only a 5 minute walk and had everything we needed. The tram is also a 5 minute walk away and including the walk takes maybe 15 minutes to get to the city center by tram. We purchased 7 day mobi passes - one pass is good for 2 adults after 9am. The lake is just down the street and is gorgeous for walking. We visited the Christmas Market and had a blast - try the Feuerzangenbowle if you're there! Also went to 5 museums, took the train to Munich for the day (cheapest was Bavaria pass which allowed the 4 of us to get to Munich and back for 38 euros total ~ 1hr 40 mins each way). We have friends that live in the city so we also visited Pottenstein and Rothenberg. New Year is also not to be missed, as everyone sets off their own fireworks, so there are tons all over the city for about an hour. Being Americans, we should have asked about the trash system - there were 3 cans which was slightly confusing for us. Also, the doorbell doesn't work so we had to actively wait by the window if our friends were coming to visit. Wireless was great, no problems at all. People in the city were awesome - I can only speak a handful of phrases in German, but anyone I asked a question in English was happy to help me. Would absolutely stay here again. We had a wonderful time and a lovely place to call home for the holiday. Thank You so much for your detailed Feed Back and for staying with us! Your Feed Back inspires me to overwork our Guest Book to add more useful informations. Sorry about the door bell! Why didn't you ask us? The door bell is working, it was simply switched off. Thank you for your Feedback. It was great having you stay in our house. We hope you had a good journey home. And we are looking forward seeing you agian. Ruhige schöne Wohnung in Toplage! Gute Anbindung zur Innenstadt, freundlicher und hilfsbereiter Vermieter. Die Wohnung ist sehr schön eingerichtet und sauber. Tolle ruhige Lage im Grünen und zum Innenstadtzentrum, das am See entlang in 5 Min. mit dem Rad erreichbar ist. Besonders haben wir das benachbarte Freibad genossen. Einkaufsmöglichkeiten und Restaurants sind in unmittelbarer Umgebung. Der Gastgeber ist sehr freundlich und hat uns gute Tipps gegeben. Vor dem Haus gibt es genügend freie Parkplätze und als im Freibad Hochbetrieb war, durften wir vor der Einfahrt zum Garten parken. Wir kommen gerne wieder! Vielen Dank liebe Frau B., dass Sie sich die Zeit genommen haben, uns zu bewerten! Wir freuen uns schon, auf Ihren nächsten Besuch! The apartments are located in the city center of Nürnberg, next to the Wöhrder Lake and offers relaxing walking in the close park. In a 2 minutes walk you can do sports like tennis, table tennis, swimming, volleyball. The holiday homes are a perfect location to explore the city by walking or public transport (S-Bahn 400m, only two stops from the beautiful old town). Ideal for fairs and excursions (motorway 8 min. and main station 10 min.) to the surroundings like Franconian Swiss, franconian lakecountry and the world heritage city of Bamberg. You can reach the Easy-Credit-Stadion in only 15 minutes on foot. For children: The toy museum, the zoo, also the Playmobilland or Geiselwind are within an easy reach. Bitte kontaktieren Sie Herrn Schlund, Ihren Vermieter, unbedingt am Anreisetag 2 Stunden vor Ihrer Ankunft, um die Schlüsselübergabe zu besprechen, damit eine zeitnahe Übergabe organisiert werden kann. Seine Handynummer lautet: 0160-7087370.